The Orion Systems Radio over IP (RIP1) device is a general purpose standalone device that interconnects analog radios to LAN/WAN connections. The RIP1 unit is capable of interconnecting far end equipment to its analog audio interface using SIP, Multicast, or Unicast. A pair of RIP1 units form a transparent digital point-to-point VoIP/RoIP link. The RIP1’s analog radio interface includes a full duplex Tx/Rx radio communication link with PTT and COR/CSQ. The RIP1 device is capable of transmitting and receiving audio in either simplex or duplex operation. The analog radio interface consists of 600/150 Ω analog transmit and receive transformer isolated audio pair. Radio keying utilizes either a PTT solid state contact closure or EIA Function Tones. The radio interface contains VOX and Carrier Operated Relay (COR) / Carrier Squelch (CSQ) detectors that can be used for radio-to-radio patch or remote keying. Management and configuration is accomplished using a Web browser. Settings such Tx/Rx line levels, Tone Keying, VOX, and SIP extension are set using a standard web interface. The RIP1 is also capable of simultaneously running multiple protocols and can be used as a conference bridge / audio summer between the various interfaces. 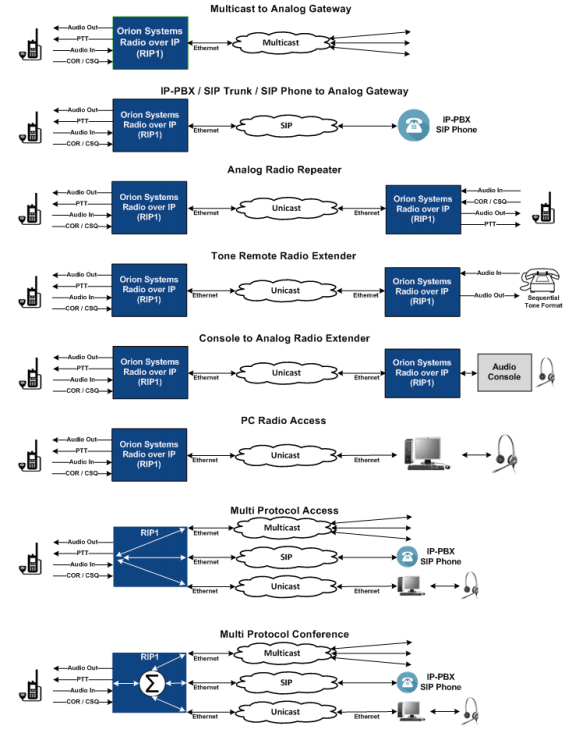 The Orion Systems Radio over IP (RIP1) interconnects analog radios to a LAN/WAN using SIP, Multicast, or Unicast. A pair of RIP1 units form a transparent digital point-to-point VoIP/RoIP link. The diagrams below show the various uses THE RADIO over and deployment options.